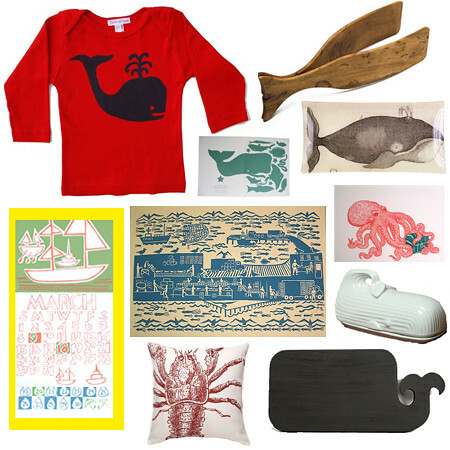 Today’s gift guide incorporates one of my favorite themes: marine life. I can’t get enough of seeing whales, octopus, and fish on t-shirts, pillows, art, and jewelry. Above and below are just a few of my favorites. For more holiday gift ideas click here. Clockwise from top left: Baby Long Sleeve Tee $24, Magnetic Wood Tongs $40, Spouting Whale Tray $92, Wicked Octopus print $45, Whale Butter Dish $68, Suddenly, it’s Real Whale Chalkboard $44, Lobster Pillow $100, Dolphin Studio Calender $98, Herring Factory Mat $12.50, The Whale and the Halibut cards $15. p.s. I added a few new pieces I found over the weekend. Shawn Creeden, Handpainted Journals, $40 each, curiosityshoppeonline.com. Bungalow 360, Whale Tote, $26, kitty-pants.com. Lauren Wolf, Sea Urchin Silver Bangle, $48.50 each, thisisauto.com. Affectionate Octopus Cotton Handkerchief, $8, tattoojessica’s shop. Great Canadian Toque Hat, $32, rain coast studio. Jumbo Applique Whale Tote, $30, Charlie and Sarah’s Shop. Biodegradable Paper Cups, $3, kioskkiosk.com. sigh I love whales too! I love the whale chalkboard! So cute in a kitchen or in a play room. What a great round up! Whales have such a great vibe—a little rustic, a little preppy all at the same time. And I love that lobster pillow! I love all the whales!